In today’s age of selling, things are different. It’s no longer effective to go door to door. It’s no longer as effective to use cold outreach methods. Today, it’s less about selling and more about educating. Education can come in many forms, but for the majority of us it’s through content - whether that be digital, audio, visual, etc. As buyers we consume massive amounts of content which help us make rational decisions about the products and services we want to buy. In the traditional marketing and sales relationship, it was up to marketing to use content to find leads and sales to use their natural “sales abilities” (i.e. phone conversations) to close those leads into customers. But considering how things have shifted, and content is now important throughout each section of the buying process, at what point do marketing and sales pool their resources and work together? Just imagine how powerful it would be if the content your marketing department created could empower your sales team and help them become more effective inbound sales reps. Sound impossible? It’s not and I am here to show you how you can make it happen for your organization! In fact, we encourage you to see that your marketing and sales departments can actually work together to grow your entire business. Your marketing department is constantly researching and developing content to deliver solutions to your visitors and leads. In turn, your sales team is armed with the tools and resources they need to close and delight their prospects throughout the entire buying experience. So how can you get the most out of your marketing content? Let’s dive a little deeper and discuss five ways your inbound sales reps can use all of your content to close more customers. In the world of inbound marketing, it’s very likely your prospect found your company through the content that lives on your website - your blog, your landing pages and even your main website. What does this mean for your sales team? It means your sales team doesn’t have to partake in endless cold calls or emails, and can stop chasing down leads that turn out to be unqualified or not right for your business. That’s right, with content, your prospects are self qualifying themselves before they even get to your sales team. And once they do, if you’re using a marketing automation software like HubSpot, your sales reps can actually see what content they have engaged with, which helps them tailor their conversation to the prospect’s individual needs and interests. And once you have that initial conversation, you know precisely what content to follow up with to further them through the sales funnel without being overly “salesy”. Instead, you're helping. Picture this, your potential customer and inbound sales rep are engaging over the phone. The prospect is trying to determine if your business is right for their business; your inbound sales rep is using the time to listen to the prospect, build trust through education and focus on the benefits both parties will gain from a partnership. In essence, this initial discovery call is an important time to not only develop a strong business relationship, but also advance them through to the next stage of the buying process. This is a great time for your team to follow up with a content offer that will take that sales experience one step further. With the right content, you can give your prospect another opportunity to learn more about your business and see that your offering is the right solution for their business. We touched on this briefly before, but it’s worthy of its own section because it’s so important. In today’s sales processes, in order to stand out, you must build trust between you and your prospect. It’s not just about helping them make a rational buying decision, it’s about connecting to their emotions. People make purchase decisions with the part of the brain that controls emotions, so when you can connect at that level, you have a better chance of closing the deal. Content can play a key role in building this trust. People like to feel empowered and knowledgeable, so rather than safeguarding information about your offering (in an attempt to build more anticipation / mystery / desire / whatever), lay it all out there. Be an open book. You want to give your prospects content that will help them make an informed decision, so leverage the content your marketing team has worked so hard to produce. Blog posts, ebooks, white papers, case studies, you name it - just be sure you’re sending them something that aligns with the conversations you’ve already had and that will actual bring them value. Let’s look at a quick features vs. benefits example so you can understand the context of this section. Let's say you’re considering purchasing a project management software. Your biggest priorities are most likely to 1) stay more organized, 2) become more efficient and 3) save time. Would you rather buy a software platform that promises to have a sleek design and easy user interface or a platform that promises to save you 10+ hours of work per week? I’m guessing you’re interested in saving that time (who wouldn’t want to get 10+ more hours out of their week!?). Features do have their time and a place in the sales process, but they aren’t what close deals. The features of your offer don’t really provide a solution - they’re focused on what makes up your product or service, not why your customers should use it. So instead, you need to think about how those features can benefit your prospect and deliver a solution that truly solves their pain. 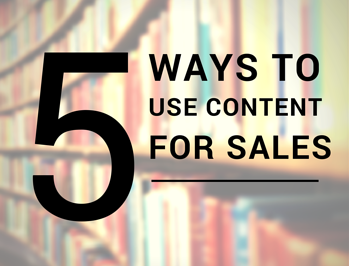 A great way to bolster your sale is to use content that highlights the benefits of your offer, not the features. Knowing this, marketing should create things like case studies, SlideShare presentations, blog posts, sales sheets and more that truly demonstrate the value of what your sales team is selling. 5. Make it a no-brainer. Regardless of how much trust and education you can provide a prospect, there is still usually some hurdles that you have to jump over. Prospects like numbers. They like proof. They want to feel confident that you can deliver on what you’re promising. And there’s no better way than to do that with case studies. We talked about this earlier, but case studies, especially metric-driven case studies, are one of the best tools you can leverage to prove the ROI of your solution. Case studies also provide you the opportunity to showcase a similar company, allowing your prospect to picture their business in a similar situation. Once you are in the position where you are trusted and seen as being honest (i.e. you'll deliver what you say you will deliver), the sale becomes a no-brainer. The cost turns into an investment. The barriers fall. And you close the deal. An inbound sales strategy is hard to effectively execute when you don’t have an inbound marketing strategy to back it up. The two go hand in hand - you need marketing to provide the content and qualified leads and you need sales to close the deals. When these two teams are working in lockstep, your organization will excel. Not only will you see an increase in the number of customers you close, but you’ll see that your business will scale and grow at a much more rapid rate. So next time your marketing department is hard at work developing a premium content offer, get ready. It’s likely going to be a tool you’re going to want to leverage to close the deal.